In this Wenzel Great Basin 10 Person Tent Review, you will get a broader look of some of the major features of this tent from Wenzel. Also, what you need beside the review are different Wenzel Great Basin Instructions so that you can set it up easily even though you can do that yourself easily. Before moving on to the detailed review, let us quickly introduce you to the features. Well, this big tent for 10 persons can be setup easily with shock corded fiberglass which is also a part of most of the products from Wenzel. To get some cool weather product, you are provided with ridgepoles, three mesh windows and roofs and lots of other stuff which we are about discuss in the detailed review. Wenzel Great Basin 10 Person Tent Features. We are now on the point of reviewing features in details for which you wait the most. Let us begin with that now. Shock Corded Fiber Glass for Easy Setup. This one feature is a part of most of the products from Wenzel. Also, in this Wenzel Great Basin 10 Person Tent, you get an advanced shock corded fiber glass. This fiber glass makes it very easy even for fewer people to setup the tent which usually takes more people and time for being setup. This fiber glass is strong and advanced enough to hold itself for a longer time. Ridgepole for Max Weather Protection. Changing weather conditions at different places for hiking and camping can be really bothering. However, when you have features such as this installed ridgepole in your tent, this will be something you wouldn’t need to worry about anymore. This has one disadvantage as well. If you are at some place stable in weather and warm, this could get hotter there. In this huge tent which serves as your cabin, you have miscellaneous stuff such as pockets large enough to store little things, has a gear loft and few stakes, three mesh windows and roofs for proper ventilation and breeze crossing and lots more. A tent which will holdout in extreme weather conditions. Can fit a maximum of 10 or even 12 people in rare cases. Mesh windows and roofs for proper ventilation of air. If not bought in sale, this could get a little over-budget. Does not have screened rooms for sleeping separately. 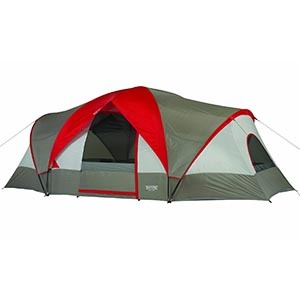 You aren’t going to find a better tent for a large group of people so even though you are running out of budget, just adjust a little and get this one otherwise, the rest is up to you.